Q:For 25 people how many sets I do you need? A:For a roll per person, you would need 25. Here comes the bride, all dressed in toilet paper? 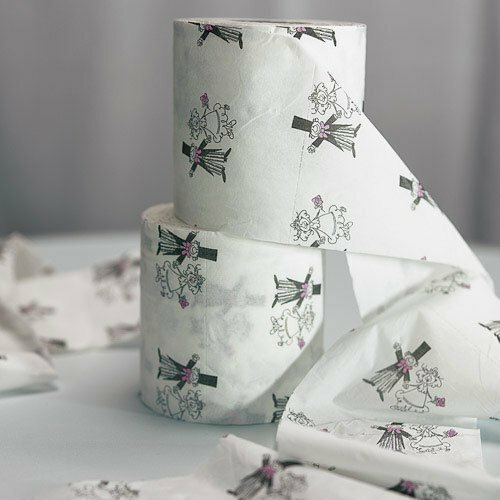 With this festive toilet paper dress game, boring and stuffy bridal shower games are a thing of the past! Create two teams – more for larger gatherings – and assign a "bride" to each team. The actual bride-to-be may not be included as she will be acting as the judge for the game. Each team will be supplied with the same amount of toilet paper and masking tape. At the bride's command, each team will begin constructing a toilet paper dress on the team's designated "bride". At the end of 10-20 minutes, the bride will yell "stop!" at which point the "bride" representatives will present their toilet paper gowns to the bride for judging. The best dress – according to the actual bride – wins!